Unfortunately we’re quite a ways off from most of the inventions in Back to the Future II, but we’re getting closer every day and Google Glass is a big step in the right direction. 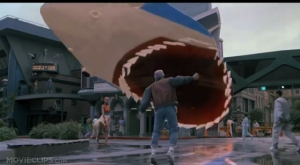 What I’m most excited about is the potential to tap into augmented reality and make walking down the street the coolest thing since hover boards. Now the first models of Glass may not be able to support augmented reality like a video game HUD, but it’s only a matter of time before our view of the world is enhanced by digital information – and this is going to turn local SEO into an incredibly competitive field. How do I know this? Well the practical applications behind Google Glass merit themselves to being locally focused. Yes, you can search for any global query with it – but the fact of the matter is that Glass is taking our eyes off the screens and putting us back into the now (at least that’s the hope). Imagine looking down a busy downtown street that you’re unfamiliar with and there are signs stacked on ads and ads stacked on signs until you don’t know where the beauty salon ends and the great Thai restaurant begins. With a simple nod of your head activate Glass and ask it something like, “show me the best restaurants on this street.” Seamlessly syncing with Google Local, Google Maps, Street View, Picasa, and other Glass users around you; Glass can not only tell you exactly where you are, but where you are looking in real time. Now comes the HUD to integrate with the real world. Four and Five star ratings taken from Google Local float alongside restaurant signs and doors. Places where your friends and contacts have been are highlighted with their personal reviews along with their filtered photos of the food they ordered (what a hipster) if you want a closer look. Choosing a spot, you have Google Glass make a reservation for two on the Thai restaurant’s website in half an hour because you just saw your friend walk by, who you would have missed if you’d been looking down at your phone, and want to grab a bite of coffee (drinking coffee is sooooo 2013). With all that being said – being a player on Google Local, online review sites, and encouraging your customers to promote your positive reviews is going to be of vital importance to get more foot traffic from Google Glass users (which will be everyone, obviously). Who knows what Glass SEO will look like, but you can bet after looking at the recent trends in Google’s changes to its algorithm that it’s going to be heavily based on user reviews. Right now, local SEO is a bit of a crap shoot. You sign up for as much local directories as you can and engage on Google Plus/Local to foster positive reviews and hopefully rank in the local listings for the keyword queries. Well local listings get thrown out the window when users are standing and looking down the street, because everyone is being listed! This will level the playing field eventually, but those who already have a presence on Google Local and have fostered positive reviews will have a BFG leg up on their next door neighbors who are trying to compete for the same foot traffic. Please, Flying Spaghetti Monster, let holographic (okay, augmented reality) sharks swoop down upon us for Jaws 99! This day cannot come fast enough for me. I’m the guy that will skip back on DVR to watch a new GEICO commercial and I cannot wait to see what kind of clever ads that the marketing teams come up with for augmented reality. Forget bidding for the highest PPC ad, what about trying to best your competitor in a game of wits when it comes to your Google Glass advertisements for the people walking by your shop. Imagine mirrors where digital clothes model themselves on the Glass wearer, or eye catching “pop-ups” that interact with you. Better yet, what about the new age of street performers who use can amplify their shows with augmented effects. There is an iceberg of advertising potential that could blow local SEO out of the water like never before. 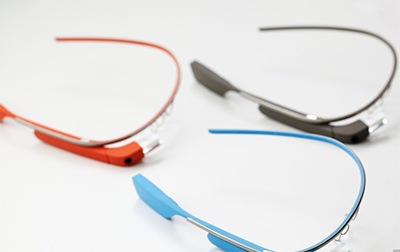 Google Glass, or whatever comes from it, is changing the way we interact with the world around us. Augmented reality in real time will be possible because I’ve seen Minority Report and I want it to be true. Jokes aside, it’s only a matter of time before this kind of local search engine becomes a big player for small and big businesses alike, and setting the cornerstone now by becoming involved on Google Plus and Local could pay dividends in the future. Sure, you may be playing right into Google’s hands, but you won’t be feeling so smug when you see foot traffic walking by you because you aren’t showing up on in Google Glass.